Celebrating a Terrific New Author! It’s official: Tracy Weber‘s delightful book, MURDER STRIKES A POSE, is now available! Tracy and I are both members of the national organization Sisters in Crime, and it’s a pleasure to support her as her debut novel hits the stores. 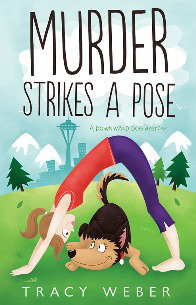 This is the first book in her Downward Dog mystery series, and I hear book #2 will soon be on its way to the publisher. We can look forward to another Downward Dog mystery soon! This entry was posted in Uncategorized and tagged cozy mystery, Dogs, Sisters in Crime, Tracy Weber, Yoga. Bookmark the permalink.